Peak electricity demand in the UK occurs between 5-30pm to 6pm each weekday evening. I have been monitoring daily power generation on an hourly basis for several years. During 2018 extra wind capacity has been added to the grid and a new interconnection between Scotland and England has improved deployment. As a result the net average power contribution of wind has increased since last year’s result. Note that my figures also include an estimated increase in metered wind power to include smaller embedded onshore wind farms using the procedure described here. Figure 1 shows the latest overall result. Figure 2 shows the yearly average contributions to daily maximum and minimum demand for different fuels. Note how at night (minimum power) the contribution of both wind and nuclear increase dramatically, although for different reasons. Nuclear is always on producing a fixed output while wind output depends only on weather conditions. The demand balance is always met with dispatchable fuels – gas, imports, coal in winter, or Bio (DRAX – wood burners). Solar output is minimal in winter. 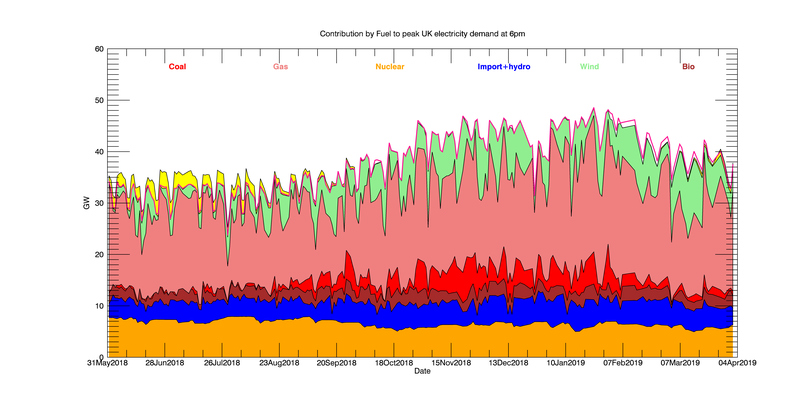 UK electricity generation by fuel for red – peak demand blue – low demand at night. Wind supplies an average 13% of peak demand and 18% of low demand at night. Our ageing nuclear stations still provide 19% of peak demand and 28% of low demand night-time energy. We can see how crucial gas generation plays in smoothing out the erratic power generation from wind in the following plot. 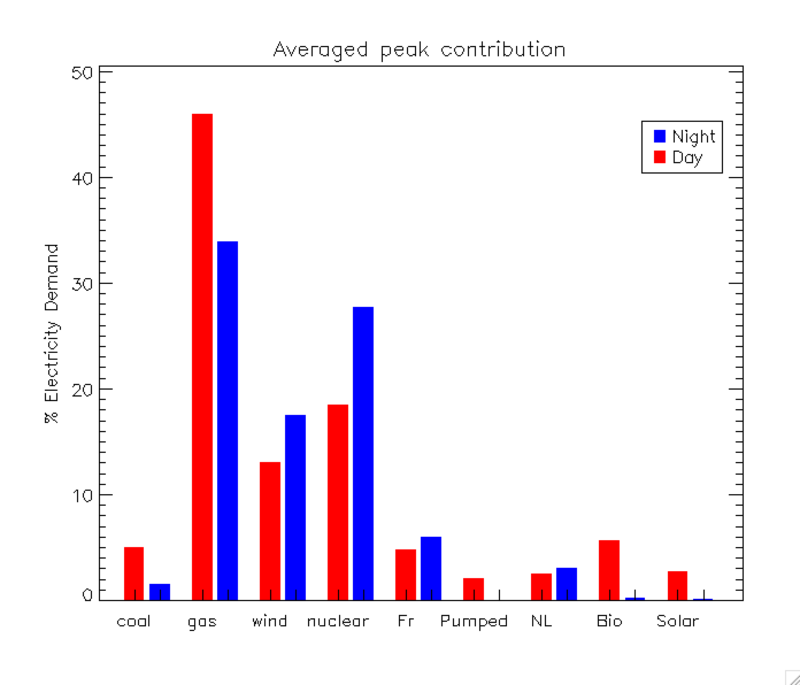 Comparison of daily peak power supply from Gas and Wind. Gas is tuned to smooth out the surges and falls in power generation by UK’s fleet of wind turbines. In 2019 roughly half the electricity supply was from low carbon sources and half from fossil fuels (gas and coal). Further expansion of wind capacity always needs an equivalent amount of gas capacity to offset days with no wind. This entry was posted in coal, Energy, nuclear, renewables, wind farms and tagged nuclear power, wind power. Bookmark the permalink. Does anyone know if coal is deemed more desirable than expanding nuclear? It seems to me the steady base that on top of a steady background of nuclear could sit the variable, solar, wind and hydro. Bio could be used as a gap filler. And gas could stand down to being the emergency backup, while coal is eventually dropped. Is that the plan? The UK ‘planned’ to build at least 3 large new nuclear stations. One is in construction (Hinkley C), the others are in limbo for financing reasons. Coal is supposed to be phased out but is still essential in winter to meet demand. Several coal stations lie idle in summer but ramp up ready to meet shortfalls in winter. The answer is a less severe regime for new nuclear, whereby years of planning are fought against continuously by the green lobby. Meanwhile Wind and solar get direct subsidies paid to them from our electricity bills. The original plan was to have at least 33% nuclear. I can’t see renewables ever working without gas backup. Ramping up and down gas stations makes them less efficient and probably shortens their lifetimes. But hey – the carbon emissions figures go down so who cares ! Perhaps the green protest movement could mature to become more proactive and practical force and compromise on nuclear in exchange for wind, bio, solar and storage technology investments. To me that seems like the brightest future prospect. However, currently, at least here in the USA, the green movement is part of the “resist” movement with arms folded except to gain full control. “Further expansion of wind capacity always needs an equivalent amount of gas capacity to offset days with no wind”.
? Do you have any reference for this claim?